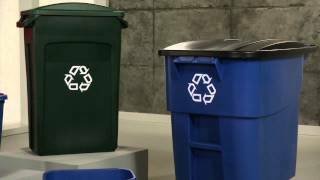 Promote recycling and improve productivity by converting your Rubbermaid 32 gallon trash can into an outdoor trash receptacle for a commercial or residential environment with the Brute 32 gallon bottle/can opening recycling lid. Strong, snap-on lids with restricted opening for recycling (bottles & cans, paper or single-stream recycling). Coming complete with a strong, snap-on lid feature that fits securely on the can, this can lid is perfect for the outdoors. Comprised of an all-plastic, professional-grade formula that will not rust, chip or peel and it resists dents. Fits Rubbermaid Brute 32 Gallon Recycling Container (RCP263273BLU, sold separately). Dimensions: 22.9"L x 9.8"W x 23.3"H, lid for 32 gallon containers. 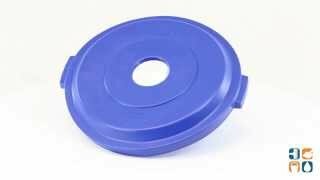 Purchased a number of these to replace existing lids that are white and show dirt rapidly. The white ones also have a much larger opening so people use it for trash instead of recycling. This are good quality, have a smaller opening that just fits bottles & cans, and are blue to match the bins so they show less dirt.